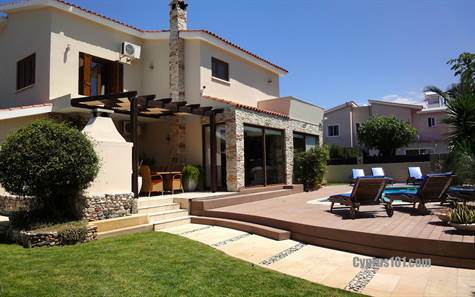 Cyprus Property Blog by Cleo : Stunning Villa Between Kato Paphos & Paphos w/ Built-in Aquarium & Tons of Extras! Walk to Kato Paphos & Paphos! Location!! Kato Paphos, Paphos - This stunning 4 bedroom property is situated in an established residential area within walking distance to both Kato Paphos and Paphos Town. Having been fully renovated by the current owners to an exceptionally high standard, the property includes many unique and modern design features. One such feature is a blue tinted glass section of flooring with smooth pebbles beneath which gives the feeling of walking on water when entering the property. The ground floor has an open plan living room with a built-in aquarium at it’s centre. On the one side is a comfortable lounge with large open fireplace, sea scape wall muriel and large patio windows with views of the pool and gardens. The formal dining area has an amazing stone wall and side port hole window. Off the living room is a large separate kitchen and second dining space with solid wood fitted units, granite worktops and breakfast bar, built-in oven, electric hob and cooker hood above, integrated dishwasher and American style fridge/freezer. Completing the downstairs accommodation is a large double size bedroom/study room and a modern guest cloakroom. Upstairs are a further three double size bedrooms, all with fitted wardrobes. The master bedroom has a walk-in closet, and en-suite shower room with the latest modern finishes. A large fully fitted bathroom is accessed directly off the landing. The outside space is also well designed with practical living in mind. Patio doors off the kitchen lead onto a large covered veranda and barbacue area - an ideal space for outdoor dining and entertaining. The gardens are beautifully landscaped with plants, trees, lawned areas, and feature stone walls. A raised decking area with swimming pool at it’s centre provides plenty of space for relaxing and sunbathing. There is a long driveway and garage accessed via electric gates and a useful and practical addition for animal lovers is a purpose built kennel tucked away at the rear of the property. With it’s great central location, spacious accommodation and amazing design features, this property has so much to offer and is ideal as a permanent residence or holiday home. Please refer to MLS#: 1097 when inquiring.